Kevin Mitnick was a hacker before hacking was even illegal. He was famous for having broken into the computer networks of some really large companies. He didn’t make a single dime from his activities; he just wanted to prove it could be done. He was eventually arrested, convicted and given a harsh five-year sentence, served in solitary confinement because the judge was convinced Mitnick could “start a nuclear war by whistling into a pay phone” (source: Wikipedia). Later, he was released from prison and started a security consulting business (Mitnick Security Consulting, LLC), and now gets paid by companies to break into their computer systems and tell them what they need to fix. Time and again, Mitnick bypassed high-tech means of hacking (using software to force his way into a system) in favor of low-tech hacks: calling people on the telephone and asking for information. It’s called social engineering, and it amounts to tricking people into giving away information simply by talking to them. Mitnick concentrates on corporate network security, teaching businesses how to keep their data safe. However, the same goes for your own personal online safety: you are the weak point. How public have you made the names of your pets, your birthdate, your children’s names and birthdates, or the school(s) you attended? (I’m looking at you, MySpace and Facebook users.) All of this information can be used to steal your identity, by providing a would-be thief with enough information to talk you into accidentally revealing too much information. Mitnick’s business card, a miniature lock-picking set, has become quite famous these last few years. Look at his website again, under the “Get Kevin’s Business Card” section. It says “Send your IP address and password to:” and his address. It’s obviously meant as a sly inside joke, but I wonder how many people actually mail this information to him. Actually, shouldn’t every week be Protect Your Identity Week? Founded in 1951, the National Foundation for Credit Counseling (NFCC), Inc., promotes the national agenda for financially responsible behavior and builds capacity for its Members to deliver the highest quality financial education and counseling services. The NFCC is the nations largest and longest serving national nonprofit credit counseling network, with more than 100 Member agencies and nearly 850 offices in communities throughout the country. Each year, NFCC Members assist more than 3.2 million consumers, helping many to drive down their debt and take control of their finances. Consumer Credit Counseling Service of Northwest Indiana is a member of this organization. They are one of the good ones—no misleading claims, true nonprofit structure, no insane promises, and an A+ rating from the BBB. So, how to celebrate Protect Your Identity Week? Had I found out about this sooner, I would have set up some live presentations or something. But hey, if you hear about any bangin’ PYIW parties, be sure to keep me in the loop, ‘kay? Wednesday’s edition of the NWI Times had an article called “Lansing police warning of scam against elderly.” It’s specific to one incident in one location, but the lessons apply to everyone. This is another con that’s been around forever and is currently experiencing a resurgence. A group of people (usually three men) shows up at your door, claiming to represent a utility company or similar. While two crooks distract the homeowner by “checking the utility box” or something, the other searches the house for cash and valuables. To me, this is a far worse situation than wiring money to a thief overseas, even though your monetary losses may be smaller. I mean, these people are in your house. If you’ve let them in, then suddenly realize your mistake, and they know you’ve figured them out, you could be in real, immediate, physical danger. A frightened criminal is a dangerous criminal. Crooks pulling this con usually concentrate on the elderly, so make sure your parents, grandparents, and others know not to let anyone in their house who just shows up on their doorstep, no matter who they claim to be. They’ll understand why you reacted as you did, and will be able to prove that they are who they claim to be. Stay vigilant out there, and make sure any elderly people in your family or neighborhood know about this scheme. On Monday, I posted about an incredibly sleazy debt counseling commercial, and promised to find out who it was and post their BBB rating and some other information. Well, apparently this ad is a “turnkey” job, where an advertising agency creates the commercial, and then plugs in the phone number of whatever company buys the ad from them. In other words, the company running the advertisement here in Northwest Indiana might not be the same company that uses it in Cleveland or Las Vegas or Anchorage. Basically, that means I can’t call them out by name and post their BBB ratings, because it could be many different debt counseling companies. However, what I can do is post a couple screenshots, so you’ll recognize it when you see it. Everything I have said or am about to say is my opinion. In other words, if your debt counseling company has been using this ad, save your time, money and breath. I’m not going to soften my position on this out of fear of litigation, because you haven’t got a case. 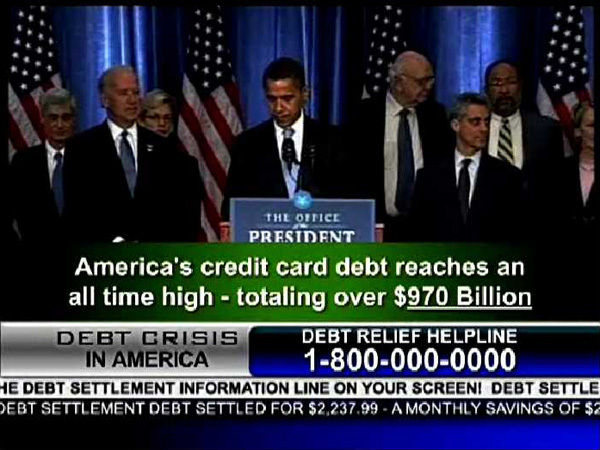 I believe that any debt counseling company that is using this advertisement is deliberately misleading consumers. They are running an advertisement specifically designed to trick people into thinking it is a genuine news broadcast (fine print or not), and that the President endorses their services. I would not give this advertisement a second glance, but if you want to figure out who is running it and what their BBB rating is, just for fun, try catching the phone number and Googling it when it appears on your TV. If you are running a legitimate debt counseling company and have been using this commercial, I would stop running it immediately. You are going to damage your credibility because of people like me throwing you under the bus with the scumbags. You may be providing a wonderful service to those who need it, but your advertising is telling a different story. If you are running a legitimate debt counseling company and have been considering using this commercial or similar, don’t. I don’t care how cheap it is. You don’t want to paint yourself with the same brush as the crooks. Looks sleazy? Is sleazy. I did a couple presentations to some eighth graders this past Monday on the topic of common email scams like lottery and mystery shopper schemes, as well as having their parents check their credit reports to make sure nothing shows up. I was surprised at how many of them had already encountered these emails, and I hope my message got through. Another topic came up, however, during the Q&A portion of the presentations: those IQ tests that always show up on Facebook. This isn’t the “Which Variety of Traditional German Sausage Are You?” tests. (Knackwurst, by the way, in case you’re wondering.) I’m talking about the IQ tests that appear as banner ads, with a few of your friends’ photos and the “score” they allegedly received, challenging you to beat them. My quick advice is: don’t even click on those links. End of story. The longer answer is this: if you click the link, it will take you to a website (not affiliated with Facebook) that asks you for your cell phone number, allegedly to give you your score. What it’s actually doing (if you read the fine print) is signing you up for a “service” with a monthly fee of $29.99. Then you take an idiotic IQ test, which is not even a little bit official, and wait until the charges show up. I guess it’s not technically a scam, since you’re told (in very tiny text) that it will charge you, and I guess you’re signing up for something (though I’m not sure what). However, it’s sort of a dirty trick, if you ask me. These ads are aimed at teenagers, most of whom aren’t going to read the fine print. I think that might have woke them up a little. There was a short “I’m still processing what you just said, and realizing that you’re probably right” silence. I took that as a good sign. All in all, a successful presentation, I think. I just saw what may have been the sleaziest credit counseling commercial I’ve ever seen. It appeared on the Weather Channel around 2:30 PM local time (I was watching Full Force Nature; they had some really killer close-up tornado footy). Now, sleazy ads during daytime television are nothing new, but this one was incredible. It began with footage of the President giving an address about the economy. I don’t know the date or specific topic of the speech—I know he used the phrase “drastic action.” This was framed by graphics designed to closely emulate the look of a broadcast from a cable news channel. There was a headline at the bottom of the screen about debt counseling, with a ticker underneath that, the kind they normally use to give up-to-the-minute stock prices. After the (out-of-context) presidential clip, it cut to a woman in front of a photo of either the White House or the Capital Building. 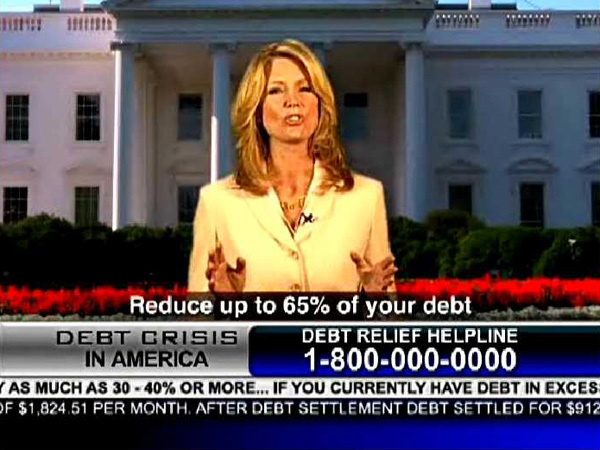 She was dressed in a sharp suit like a news anchor, and was telling you to call now for information on debt elimination. The headline and ticker remained at the bottom of the screen. If you weren’t paying close attention, you might easily mistake it for a genuine news item. Naturally, the color scheme of the ad was red, white and blue. Ads that run during daytime television are created under the assumption that you are jobless, directionless, desperate and not very intelligent. In other words, they’re insulting. Take them with a massive grain of salt. I didn’t catch the name of the company, but I wish I had. I’d gladly post it here, along with their BBB rating and the advice to not use their services. If I catch the commercial again, I’ll make note of this information. If it is a legitimate, non-profit counseling service, they need to be told that their advertisements are misleading and unbecoming. If they’re not, they need to be called out on it and run out of business. There are real, non-profit credit counseling services available for those who need them. REGIONAL has a relationship with Consumer Credit Counseling Service of Northwest Indiana. They’ve got an excellent BBB rating. If you’re in a different area, start with the Better Business Bureau, and don’t use any service with anything less than an A rating.